By the time I got to the park, around 3 pm, the campground was completely full, so my plan to stay overnight was nixed. 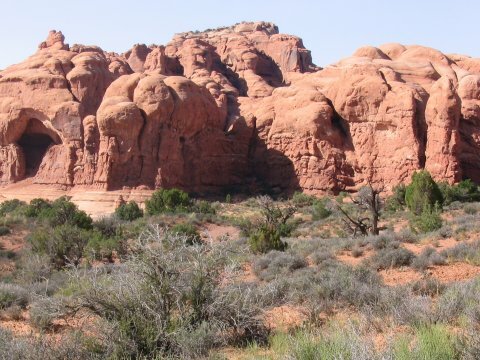 I still had plenty of time to check out some of the sights in the park, and just had to find a motel in Moab, just a few miles outside the park. I stopped first for a look at the Windows section. The "primitive" trail had some nice views. I am pretty sure I got a look at the park highpoint, Elephant Butte, from the Windows area. 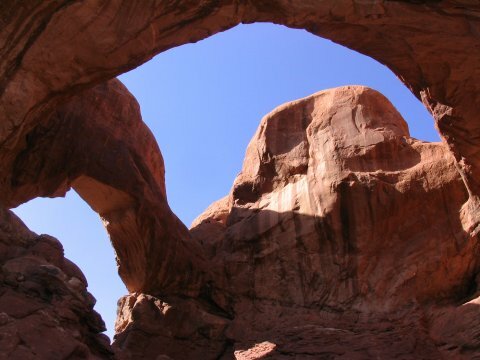 Between the Windows and Elephant Butte is Double Arch. The trail to directly underneath this formation is short and easy. 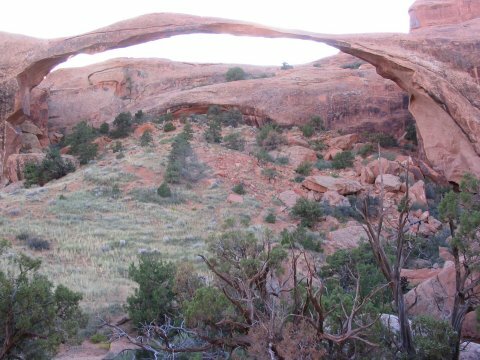 After these short hikes, I drove to the north end of the park and hiked the also short and easy trail to Landscape Arch. 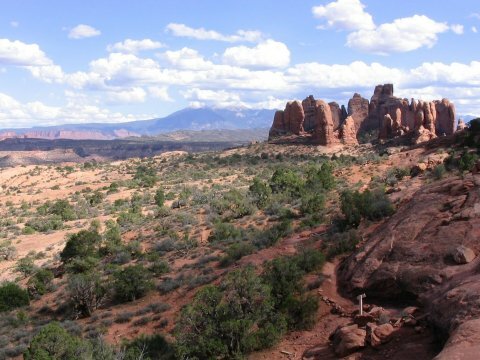 You can make this a longer loop hike, but I didn't have the time, since I planned to hike to Delicate Arch around sunset. 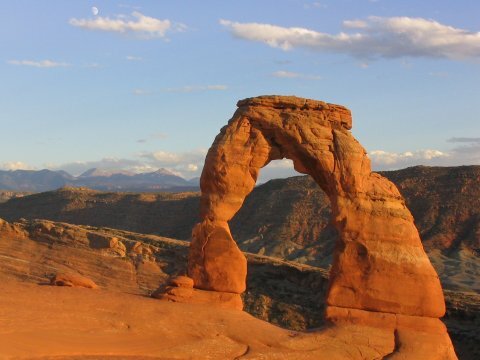 The Delicate Arch hike was the definite highlight of my stay here. I'll say that nobody should come to the park and skip this. 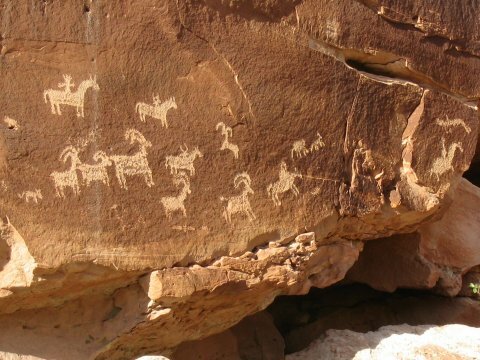 The 3 mile roundtrip starts with a look at some petroglyphs, then continues up a gradual slope on bare sandstone. 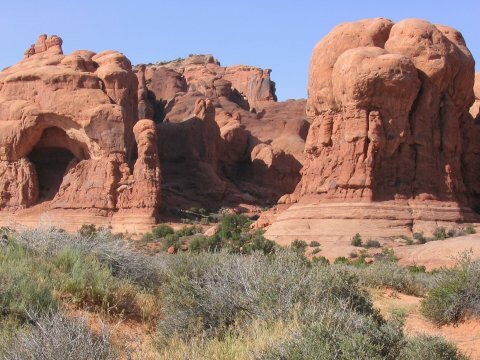 The rock is nice to walk on, and the surrounding sandstone formations are cool looking. Eventually, the trail follows a wide, flat, ledge along the edge of the rock formation. 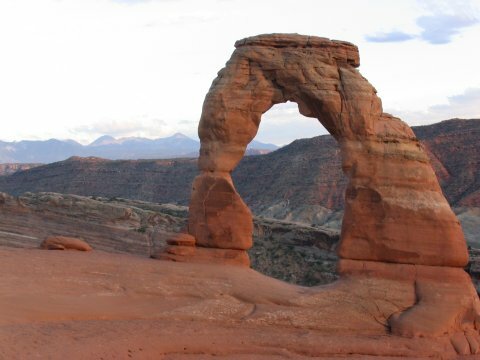 I was a little startled when I came around the edge to the first look at Delicate Arch. 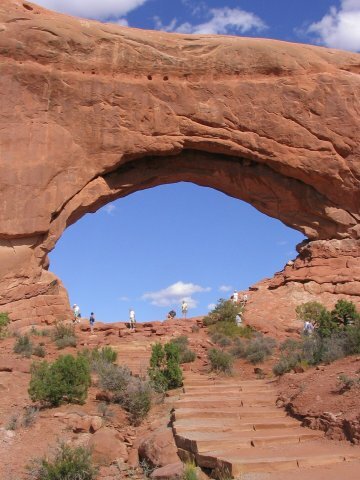 I'd never seen the arch before in my life, but the sudden view was very familiar. This is the scene on the Utah license plate! I did this hike just before sunset, as per the park recommendations, and it was a good idea. The hike was prettier and a lot more comfortable this way. There are lots of comfortable places to sit and rest while enjoying the view. This is fortunate, as there were plenty of other hikers around. I stayed until just after sunset, and when the colors were gone I went back the way I came. 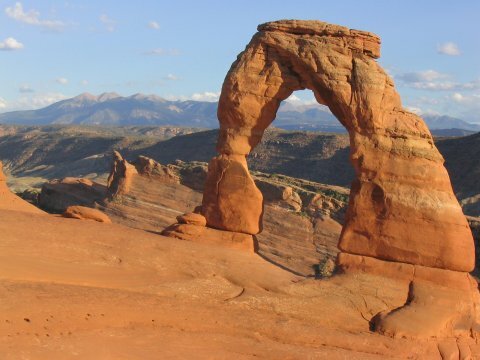 Another view of Delicate Arch. 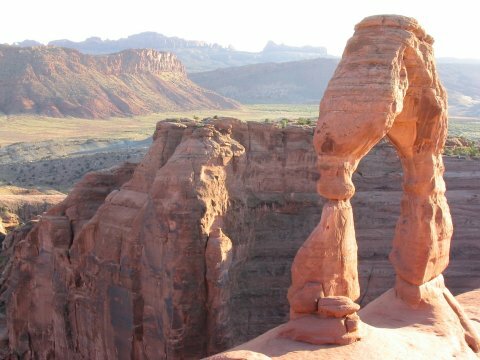 http://www.cohp.org/natl_parks/Arches_1.html - An Elephant Butte trip report.